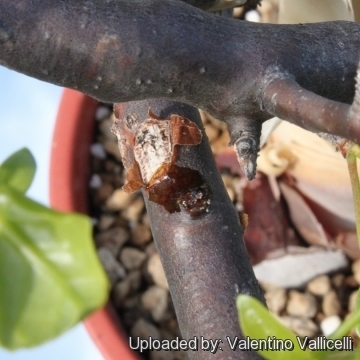 Accepted Scientific Name: Commiphora kataf (Forssk.) Engl. Monogr. Phan. [ A.DC. & C.DC.] 4: 19 1883. A.DC. & C.DC. Origin and Habitat: Commiphora kataf spread over a wide area in Africa and Middle Orient (Somalia, Djibouti, Abd al Kuri, Ethiopia, Sudan, Kenya, North Tanzania, Arabia and Yemen). Altitude range: 75–1560 metres above sea level. Habitat and ecology: Acacia-Commiphora woodlands, wooded grassland, bushland and dry coastal bushland. This species usually thrive in rocky areas particularly on strep limestone hills. The fruits of Commiphora kataf are eaten and spread by baboons. Balsamodendrum kataf (Forssk.) Kunth ex DC. Monogr. Phan. [ A.DC. & C.DC.] 4: 19 1883. Description: Commiphora kataf is a small tree growing up to 8 metres, occasionally to 10 metres tall, unarmed. C. kataf is very variable in indumentum characters, as well as in shape, size and dentation of the leaflets. It is still unclear whether this variable complex is one or several species and the various forms are connected by intermediates it is difficult to recognize infraspecific taxa. The typical Commiphora kataf (from arabia) has a sparse or copious indumentum but this is not stiffly erect and has much gentler (less sharp) and often fewer crenations of the leaflet margins. Stem: The bole can be 30-50 cm in diameter and unbranched for up to 5 metres. Bark whitish to yellowish, smooth, peeling in papery flakes, with bluish under-bark; branchlets subglabrous to densely pubescent. The wood and bark of this plant has a strong odour and yields a gum resin. Although the resin exudes by itself from the stem or the thick and stiff branches, the flow can be increased by means of incisions. Initially the clear, white, or yellowish-brown resin is soft and sticky, but upon dripping to the ground to the ground it hardens and turns dark red or black. Leaves: 3-foliolate or rarely some 5-foliolate, glabrous to densely pubescent. Petiole 0.5–6 cm. Leaflets ovate or elliptic to obtriangular or suborbicular, 0.5–7 cm long, 0.3–6 cm wide, acute to emarginate at the apex, with shallowly crenate to distinctly serrate margins. Male flowers: 1–several together on 1–8 mm long pedicels. Female flowers: 1–2 together. Calyx 3–4 mm long, pubescent. Petals yellow, 3–4 mm long, subglabrous to pubescent. Fruits: ovoid to subglobose, 8–16 mm long, 8–13 mm thick, glabrous to pubescent, on a c. 3–15(–20) mm long stalk. Seed (stone). Ovoid to suborbicular, flattened, c. 7–10 mm ling, 5–7 mm wide. Notes: Kankamon is described by several ancient writers. It appears to be a gum resin that is similar to myrrh. To cite Dioscorides, it is "the exudation of an Arabian wood, in a certain way resembling myrrh, . . . which is used as incense and also for fumigating clothes along with myrrh and storax"; he then lists its virtues as a medicament. A number of commentators have sought to identify kankamon with one of the gum resins, of lesser value than myrrh, found in Arabia. However, other authors reject out of hand an Arabian origin. And Pliny states that 'cancamum' to use his spelling-comes from the same place as cinnamon and cassia, which would mean eastern Africa. 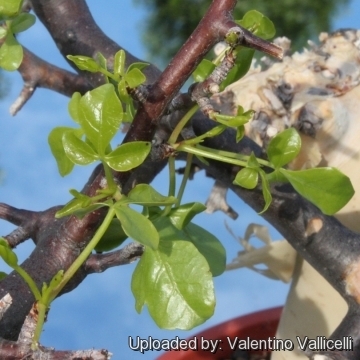 The “kankamon” tree has been identified as Commiphora kataf, that grows in Arabia. However, there is a tree found in Somalia, Commiphora erythraea, which so resembles it that the two are now considered the same. 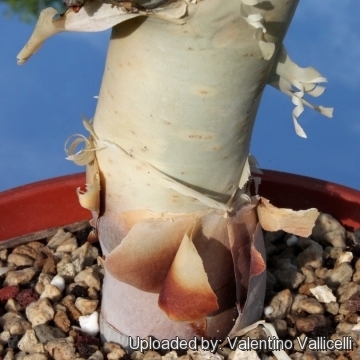 C. erythraea produces a gum-resin, African bdellium, that, is so similar to myrrh that it has been called 'false myrrh'. 12) Wiersema, J. H. & B. León "World economic plants: a standard reference" (on-line edition) [medicinal plants only]. 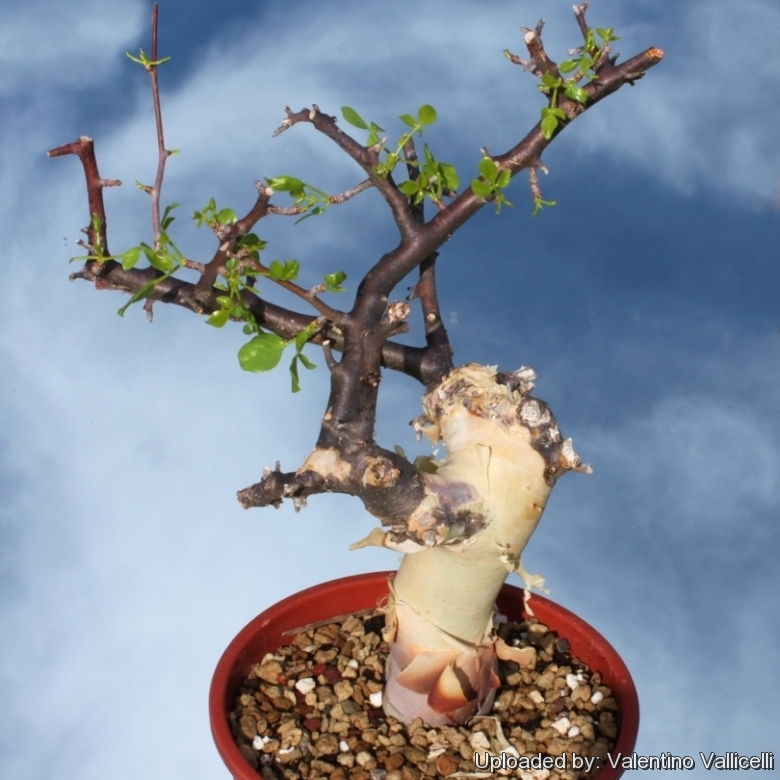 Cultivation and Propagation: Commiphora kataf requires a sunny position and a well-drained soil. The plant can be pollarded or coppiced. The branches easily sprout roots and shoots and makes it a favorite bonsai species amongst bonsai enthusiasts. It is a vigorous grower but plants are sensitive to frost. Quite easily actually, and strangely enough, they are killed more from love than neglect. Over-watering in winter is probably the biggest cause of death with this species. They have very soft wood and if it receives too much water in the dry months can quite easily rot. 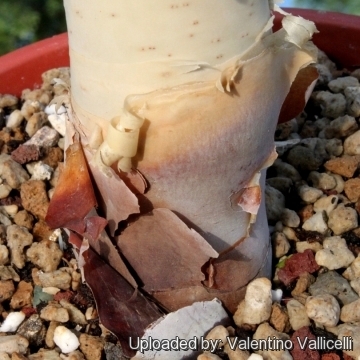 It does not put out a deep taproot but develops a good network of smaller roots and can be planted in quite shallow pots. From a bonsai point of view, another very desirable feature of this species is its ability to heal from quite drastic surgery. Not only do the scars of a cut close over very quickly, the bark grows remarkably quickly as well, and it takes just a couple of years for it to cover all but the largest of scars, and even these will disappear before too long. Medicinal uses: resin is used to treat stomach disorders, digestion, ulcers, colds, cough, asthma, bronchial congestion, arthritic pain, leprosy, syphilis, as a stimulant, antispasmodic, and to increase menstrual flow. Topically, used for mild inflammation of the oral and pharyngeal mucosa, itching, scabies, wounds, aphthous ulcers, gingivitis, hemorrhoids, abrasions, furunculosis. Other uses: The stems are probably a source of the gum resin 'Bursa Opopanax', which is used in perfumery, as an incense and as an insecticide.